For appetizer, they served us Macau Chorizo and Cheese Tidbits (P240.00/US$5.40). We loved the chorizo and keso de bola combination, the mild cheese balances the rich flavor of the chorizo. 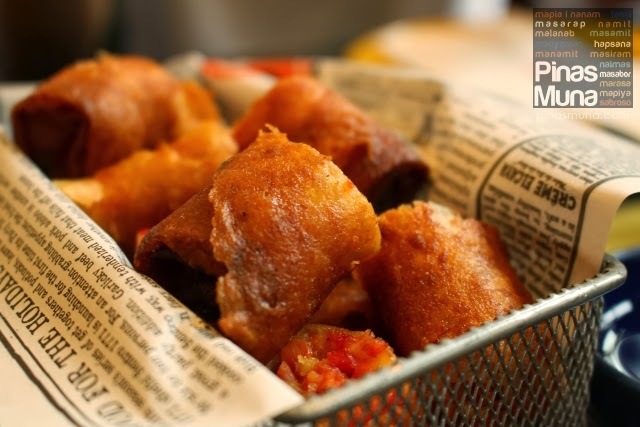 The tender fillings are also contrasted by the crispy wrap of the rolls. They also served us Duck Pancakes (P170.00/US$3.80). Here is the right way to eat them: use the pancake pockets to hold the fillings then slide the spoon out of the pocket leaving all the ingredients inside, then fold the opening of pocket, dip in the sauce then take a big bite. Peking pancakes filled with strips of native duck slow-cooked in beer, rhum vinegar, soy sauce and muscovado sugar (four pieces per serving). Aside from the plain rice (P45.00/US$1.00), they also had us try their new rice variants. 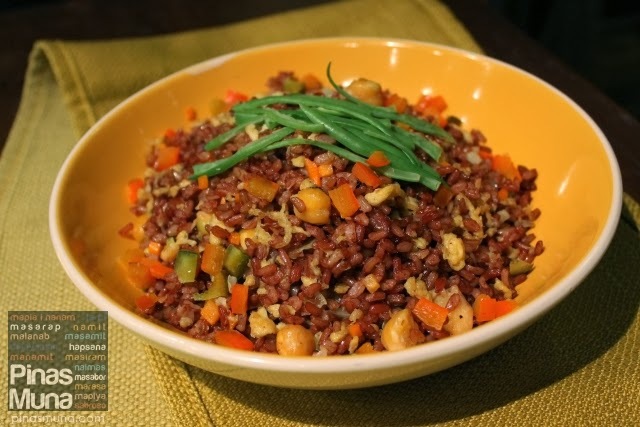 The Vegetarian Red Rice (P180.00/US$4.00) is perfect for those on diet. The red rice has more fiber while the vegetables mixed in the rice are a good source of nutrients. 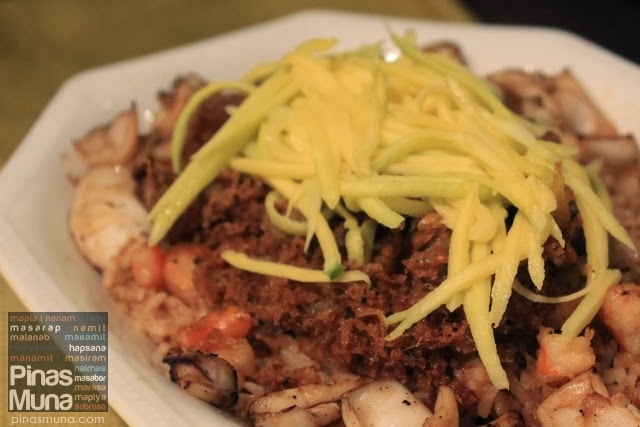 There is also the more savory Seafood Bagoong Rice (P530.00/US$11.80). It has so much seafood toppings which make this already a complete meal in itself. Red organic rice stir-fried with garlic, cabbage, carrots, celery, onions and chickpeas. Topped with grilled squid, garlic shrimps, hito flakes and shredded green mangoes. For viand, we of course started with Sentro 1771's specialty of the house, the famous Sinigang na Corned Beef (P595.00/US$13.30). This is best paired with plain rice because you don't want other flavors to ruin the taste of this dish. We also learned that Sentro 1771 uses Prague salt (pink salt) to cure their corned beef, thus the bright pink color of the beef. 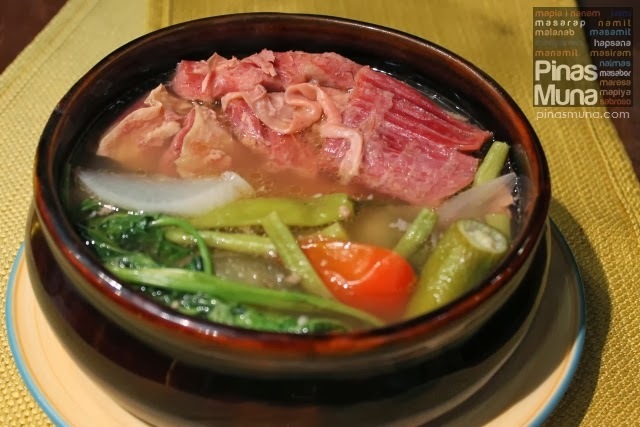 They also use fresh vegetables in their sinigang making them equally exquisite as the corned beef. Corned beef short plate and boneless beef shanks in tamarind broth with native vegetables. They also served us one of their signature dishes, the Lamb Caldereta (P480.00/US$10.70). We're glad they did because we have always been curious about this caldereta. We love caldereta, but it was our first time to try it with lamb. It was perfectly cooked. Very tender lamb meat and it didn't have the gamey smell (hindi maanggo in Filipino). 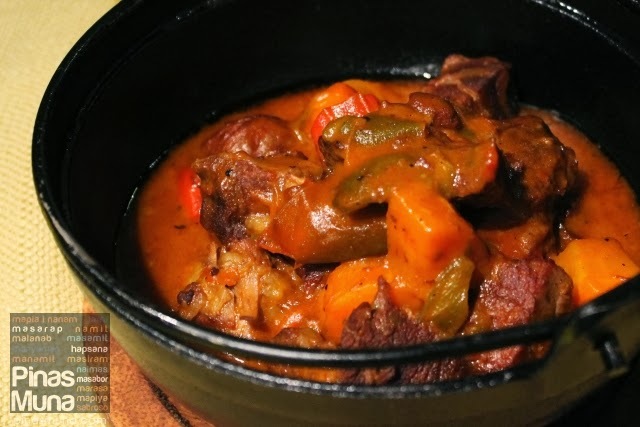 Boneless lamb shoulder stewed with carrots, bell peppers, tomato sauce, and spices. Can be mild or spicy. Sentro 1771 added a new section on their menu called Iba't Ibang Adobo (English: Variety of Adobo Dishes), and they had us try their Chicken Adobo sa Gata (P250.00/US$5.60). 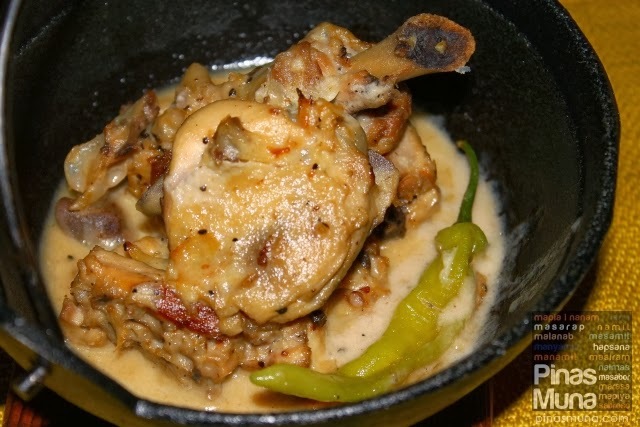 The Filipino in us loves any dishes that has coconut milk in it. The Chicken Adobo sa Gata for us is more of a ginataan dish than an adobo, only because we are from Metro Manila and we are used to the adobo cooked with soy sauce, vinegar, garlic and peppercorns. This however lived up to our Pinoy taste. The sauce was very savory, we can survive with just that sauce and rice. We wanted to crush that green pepper to give it a more spicy flavor. Still retains the vinegar-garlic-peppercorn balance but thickened with coconut milk. Two other items from their new menu followed. We were already full at this point, but they look very scrumptious we couldn't help it but try them as well. 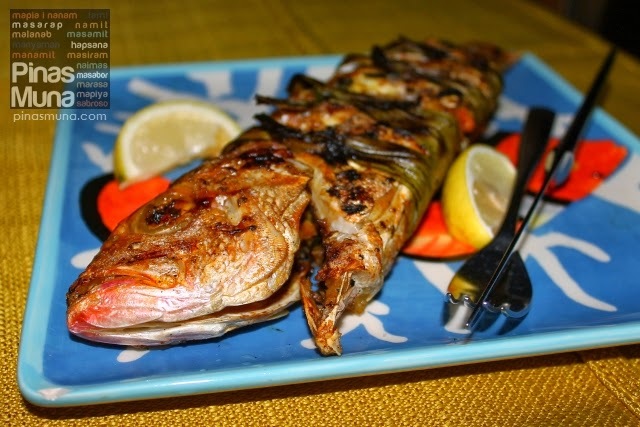 The Fish of the Day Pandan (P220.00/US$4.90 per 100g of fish). Another healthy option because this one was grilled and not fried. For those staying away from oil, this one is for you. You can match this with the vegetarian red rice. Note that the type and size of fish varies depending on what was freshly caught that day. Next came the Camote Cups (P240.00/US$5.40). Camote (English: sweet potato) is used as a container to serve this dish of stir-fried vegetables. 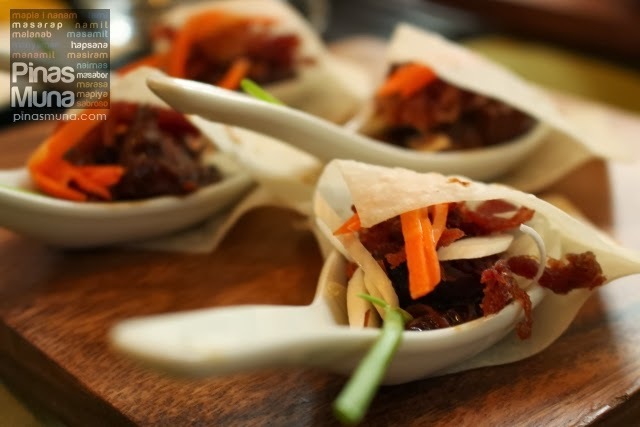 We find it similar to the lumpiang hubad filling, only the presentation is different. 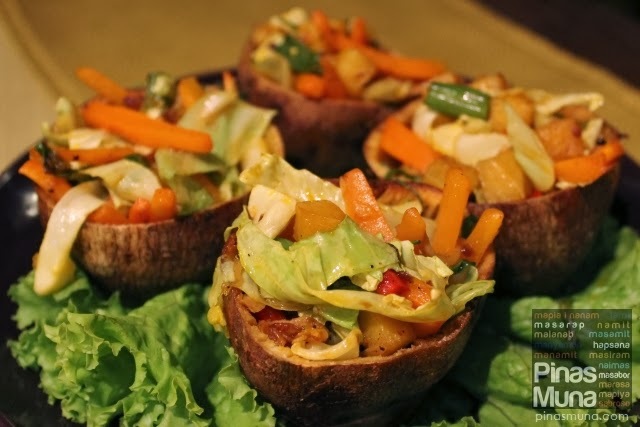 Camote cups are then served with sweet-garlicky sauce. 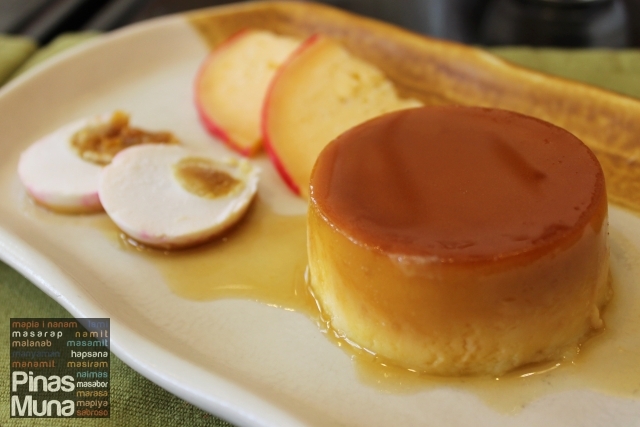 Finally, for dessert, Sentro 1771 served us the famous Keso Flan (P220.00/US$4.90). The cheesecake itself tastes like leche flan, but has the cheesecake texture. When mixed with salted egg and queso de bola, this dessert will leave an aftertaste of bibingka in your palate. 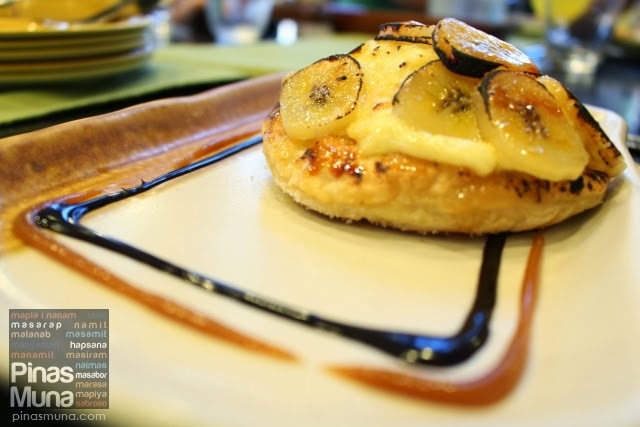 We featured the Keso Flan as one of the Bibingka-Inspired Desserts for Christmas last December. Baked but light, no-crust cheesecake, served with queso de bola and salted egg. Last December, we were again invited to sample Sentro 1771's new dishes, this time with another group. We thought that they will be serving dishes different from what we tried last September, but they basically served the same menu. We skipped most of the dishes except these two desserts. 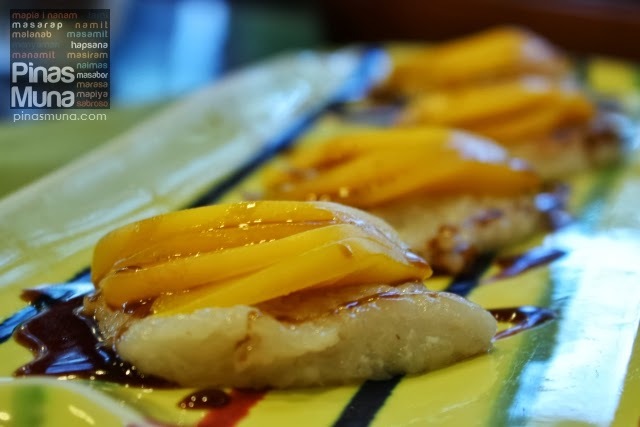 The Fried Suman & Mangoes (P180.00/US$4.00) is a classic Filipino dessert enjoyed all over the country. This one though is a bit different because the suman was fried, giving it a light crispy texture. Lastly, we had the Banana Tart (P150.00/US$3.30). It was quite a simple dessert of a flat pastry topped with bananas. The taste is light, not too sweet. The bananas were caramelized giving it a bit of a roasted flavor. 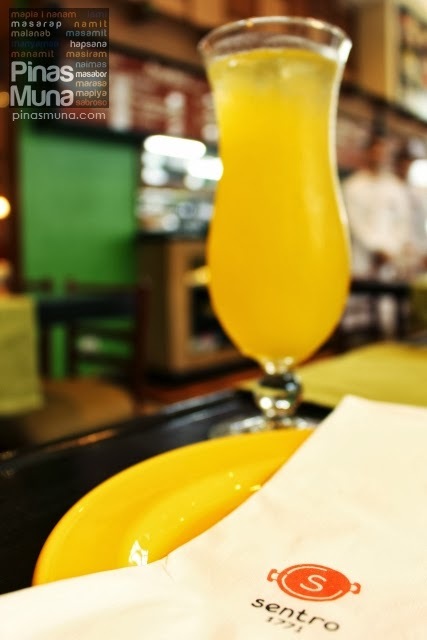 We would love to match this with brewed coffee. 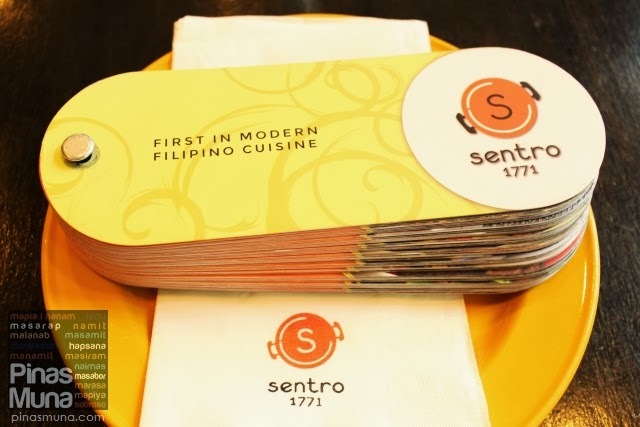 Sentro 1771 has branches at Serendra Bonifacio Global City and at Greenbelt 3 Makati. A third branch will open at the Capitol Commons in Pasig City.